Wondering How to Declutter Your Life? Clutter is stuck, stagnant energy and prevents us from moving forward and sharing our gifts with the world. When we remove clutter we create the life we choose, deserve & desire. You can learn how to declutter your life. 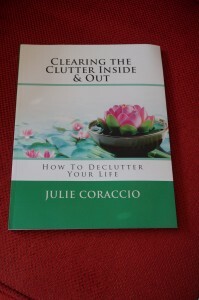 In her work as a coach and professional organizer, Julie Coraccio witnessed that when people cleared physical clutter, inner clutter (emotional, mental and spiritual) was also released. Likewise, when people removed inner clutter they began to release physical clutter. When we let go of what no longer serves us, we can call into our life what we choose, deserve and desire. This course is available as a video and is a year long, 56-week course designed to support you in clearing physical, mental, emotional and spiritual clutter and learning how to declutter your life. Also includes is a bonus month focusing on energetic clutter. Some people might need the entire year (or more) while others may be able to finish more quickly. It is designed to build your decluttering muscles and to go at your own pace. One of the biggest reasons I see people fail to get organized or declutter their lives is because they become too overwhelmed and try to do too much at once. This course is broken down into easy to manage steps to prevent becoming overwhelmed. This comprehensive course that will guide you step-by-step in how to clear clutter and simplify your life. Each section is divided into 3 months/12 weeks. On the 13th week of each section, you are directed to create a clutter free living maintenance plan. There is also a 4-week bonus on energetic clutter. This course is designed to build a strong foundation for personal growth and releasing clutter. It is 8.5 x 11 in size and 162 pages. We keep a few copies on hand, but otherwise print on demand. Please allow 7 to 10 business days for delivery. If you are clear on what’s important it’s easier to release clutter. You will define your priorities and then determine if you are practicing what you preach and create a plan if you aren’t. You will decide your realistic level of clutter, create a plan for decluttering and design a vision for each room. Once this is completed, you will begin purging physical clutter. An unsettled mind can create lots of anxiety, worry and other mental clutter. If you tend to procrastinate or avoid you can be causing yourself undue stress and there could be some underlying fears. Living in the present moment creates a happier life and helps relieve past and future mental clutter. In this module, you will relieve monkey mind through meditation. Next, you will examine where you procrastination and avoid, a mindset that usually goes hand and hand with clutter. Finally, you will begin to practice living in the present, as that is where the point of power is to change and create. When we are unkind to ourselves, or allow others to mistreat us, much emotional clutter can be created. Additionally, discovering why you try to control things can support you in releasing emotional clutter. In this module, you begin with discovering in what ways you are unkind to yourself. Then it’s time to examine whom you surround yourself with and your closest relationships. Finally, you will determine whether you are in flow with life or trying to control it. When you strengthens your spiritual / religious life, you tend to reduce clutter in all areas. You’ll start with a life inventory, making changes and discovering gifts. Next, you will develop and express your gratitude. Finally, you will explore and create a spiritual/religious practice that resonates with you. Even though we can’t see energetic clutter, we can feel it. How our homes and office feel can impact our lives. A heavy feeling room with a lot of stuck, stagnant energy can gather physical clutter. An area that feels good is a place where we want to be and can buoy our mental, emotional and spiritual states.